“The castles of Caernarvon, Beaumarais, and Conway, all on this north-west coast of Wales, are monuments of the subjection of the Principality by Edward I. Other castles on this coast he took and strengthened, for instance those of Flint and Rhuddlan, as yokes on the necks of the North Welsh; these three he built expressly for that purpose, and, though all now more or less in ruin, they remain splendid evidences of his power, and of the architectural taste of the age. 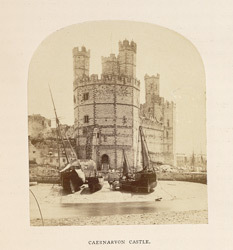 We have not finer specimens of castellated building than in the fortresses of Caernarvon and Conway... Even the Welsh, who do not forget the object of their erection, yet regard them with pride. Excerpts from “Caernarvon Castle”, in ‘Ruined Abbeys and Castles of Great Britain and Ireland’ by William Howitt.